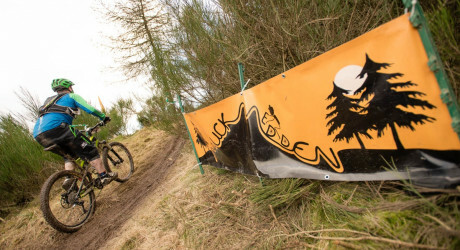 MUCKMEDDEN, Perthshire’s self-styled purveyors of ‘muckin’ good mountain bike events, have announced an exciting line-up for 2019 that includes the much-anticipated return of their ‘6hour’ endurance event on Sunday 07 April. On Saturday 26 October the sell-out Halloween fancy-dress spectacular, The Fair City Enduro, which has just been announced as Scotland’s only Enduro World Series (EWS) Qualifier event in the 2019 race calendar, returns to the centre of Perth. Earlybird tickets, offering 20 per cent off entries to the events, will be available from 21.00 on Tuesday 18 December 2018 to Friday 01 February 2019. In addition to hosting their own ‘muckin’ good events in 2019, the Muckmedden team will also be touring festivals and events across Scotland with their fantastic mobile bike track. Suitable for riders of all ages, from novice to advanced, Muckmedden deliver a fun-fuelled ‘plug and play’ bike experience, incorporating bike hire and skills coaching sessions, at indoor and outdoor venues across the country all year round. In recent years, Muckmedden’s events have been firmly focused on family-friendly mountain bike festivals – Cream o’ the Croft, Angus Cycling Festival and The Eliminator. With the long-awaited return of ‘The 6hour’ endurance race, first staged at Pitmedden in 2012, the line-up for 2019 takes the event organisers back to their full-on racing roots. Though shorter than similar Scottish mountain bike endurance events, Pitmedden’s labyrinth of sumptuous natural singletrack, from fast and flowing to tough and technical, will give intermediate and elite level riders a seriously testing, yet fun-filled, technical and physical challenge when they take on the 6Hour race. The event, being staged on Sunday 07 April, is open to Solos and Pairs and even has a separate category for Retro/Singlespeed bikes for those riders looking for an extra challenge! Aaron Gray, from Muckmedden Events, is excited about the first return to the venue since 2015: “Pitmedden, which straddles the Perthshire and Fife border, is my local riding spot as well as the venue where we held the first Muckmedden Event back in 2012; our spiritual home!. “As a rider who prefers downhills to climbs, this is my kind of ‘cross country’ riding because the trails are so engaging. When you know your way around there’s no better place to ride than Pitmedden, but if you don’t, it’s easy to miss all the best bits. That’s the reason I held the first 6Hour event here, as I felt that riders were missing out on Scotland’s hidden gem. Established seven years ago, The Fair City Enduro, the annual sell-out enduro mountain bike race, will again be staged in Perth’s city centre on Saturday 26 October. It is widely regarded as one of the top mountain bike Enduros in the UK thanks to a jaw-dropping mix of world-class mountain biking and some truly outlandish fancy-dress outfits. As a result of the event’s growing reputation, it has been selected as Scotland’s only Enduro World Series Qualifier for the second year in succession. Aaron was keen to point out that despite gaining EWS Qualifier status, the fun-focused vibe of Fair City Enduro has stayed the same: “I was delighted when we got EWS Qualifier status this year, but I was determined that the event would stay true to its fun and family-focused ethos. Fair City Enduro was elevated to EWS Qualifier status in 2018, providing an opportunity to promote mountain biking in Perthshire, and the event itself, to a wider audience. The event sold out at 420 riders, attracting entrants from as far afield as Iceland, Austria and all corners of the UK. 6Hour Image attached – Please credit Ian Potter – PK Perspective. Muckmedden are back where it all began in 2012! With a history of mountain bike racing stretching back to the 16th Century (well almost) Pitmedden is an absolute labyrinth of singletrack. You’ll find no manicured trails here, just technical, natural singletrack that will test the skill and stamina of any mountain biker. Open to solos and pairs, the 6hour is a mass start Endurance Cross Country race which will push riders to the limit to complete as many laps as possible within a six-hour period. But it’s only six hours though, right? How hard can it be? 6hour is open to riders aged 12 to 50+, male and female. The race is open to solos and pairs with a capacity for 450 riders to take on the challenge. The third and final ‘Muckin’ Good Event’ of 2018 is the Fair City Enduro (FCE). The Halloween fancy-dress themed Enduro race is rated as one of the best mountain bike Enduro races in the UK and returns this year as Scotland’s only Enduro World series qualifier event. A combination of ‘breath-taking trails, breath-taking views and even more breath-taking outfits’. Fair City Enduro is open to riders aged 12 to 50+, male and female, and has a capacity for 420 riders to take on the challenge. Check out too twitter.com/allSportsPR, twitter.com/allOutdoorsPR and twitter.com/allPerthPR.